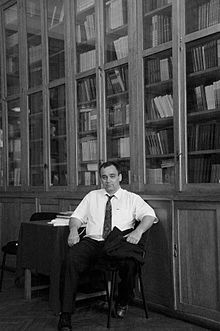 Imre Galambos (Chinese name 高奕睿, pinyin Gāo Yìruì; born 1967) is a Hungarian Sinologist and Tangutologist who specialises in the study of medieval Chinese and Tangut manuscripts from Dunhuang. He is currently a Reader in Chinese Studies at the Faculty of Asian and Middle Eastern Studies at the University of Cambridge. Galambos was born in Szőny, Hungary in 1967, and studied at the Eötvös Loránd University in Budapest. After graduating with an MA in 1994 he went on to study at the University of California, Berkeley, and in 2002 he was awarded a PhD, with a dissertation on Chinese writing during the Warring States period. Galambos worked at the British Library in London, England from 2002 to 2012, where he was a member of the team working on the International Dunhuang Project. During this time he specialised in the study of Dunhuang manuscripts, and collaborated with Sam van Schaik on a study of a Dunhuang manuscript comprising the letters of a 10th-century Chinese Buddhist monk on pilgrimage from China to India. Whilst at the British Library he also published studies on The General's Garden and other Tangut translations of Chinese military treatises. Since 2012 Galambos has been a lecturer in the Faculty of Asian and Middle Eastern Studies at the University of Cambridge, where he teaches pre-modern Chinese Studies. 2016. Gerard Clauson's Skeleton Tangut (Hsi Hsia) Dictionary: A facsimile edition. With an introduction by Imre Galambos. With Editorial notes and an Index by Andrew West. Prepared for publication by Michael Everson. Portlaoise: Evertype. ISBN 978-1-78201-167-5. 2011. "The northern neighbors of the Tangut"; in Cahiers de Linguistique – Asie Orientale 40: 69–104. 2011. "The Tangut translation of the General’s Garden by Zhuge Liang"; in Written Monuments of the Orient 14(1): 131–142. 2008. "A 10th-century manuscript from Dunhuang concerning the Gantong monastery at Liangzhou"; Tonkō Shahon Kenkyū Nenpō (敦煌寫本研究年報) 2: 63–82. 2006. Orthography of Early Chinese Writing: Evidence from Newly Excavated Manuscripts (490–221 BC). Budapest Monographs in East Asian Studies. Budapest: Eötvös Loránd University. ^ "Dr Imre Galambos — Faculty of Asian and Middle Eastern Studies". www.ames.cam.ac.uk. Retrieved 2016-12-04. ^ "Tudós a Selyemúton". 5 May 2012. Retrieved 2014-12-12. ^ "Chinese Studies Teaching Staff: Dr Imre Galambos". University of Cambridge. Retrieved 2012-11-13. ^ Galambos, Imre; van Schaik, Sam (2010). "Following the Tracks of a Tenth-Century Buddhist Pilgrim" (PDF). IDP News (35). ISSN 1354-5914. ^ "IDP Quarterly Report: April – June 2012" (PDF). International Dunhuang Project. Retrieved 2012-11-13.